Angela Farris Watkins recounts her childhood memories of the Rev. 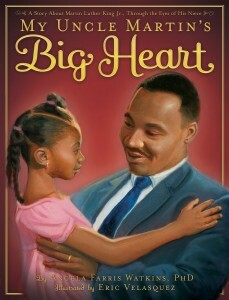 Martin Luther King Jr. in the forthcoming book, My Uncle Martin’s Big Heart. Her recollections are warm and personal, and give children an opportunity to understand what motivated one of the most successful social justice movements of the 20th century. Eric Velasquez’s portrait-like illustrations help underscore the importance of the subjects of this book, both Dr. King and the cause he led. As the title of her book suggests, Dr. Watkins finds that what made her uncle so special from her perspective is what also motivated his politics: his love. Readers are left asking themselves: How can we bring about Dr. King’s view of a world of equality today? How does our love — for our families, our communities, animals, or the environment — motivate our actions? Kindness breeds kindness – humans to humans, humans to animals. Thank you.